For over 15 years Denis has been acting for foreign investors (strategic players, private equity, banks and other lenders) in cross-border transactions involving Ukrainian assets, and investments in greenfield and brownfield projects. He regularly represents major companies and investors in the Ukrainian economy (including acting on behalf of foreign and domestic clients at the Antimonopoly Committee of Ukraine and the State Property Fund of Ukraine) in acquiring Ukrainian strategic assets and establishment of joint ventures. During the 2000s, Denis acted for major Ukrainian clients in privatisation projects (steel and natural resources) in Central and Eastern Europe (Hungary, Poland and Czech Republic), also representing their interests before the European Commission in financing and competition (including state aid) matters. 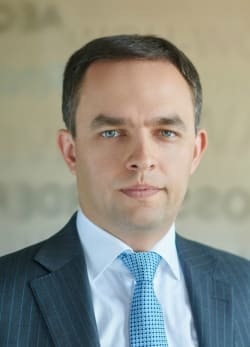 He has extensive practical experience in restructuring groups of companies and legal due diligence, successful support and closing of cross-border and domestic M&A deals, as well as thorough tax planning for optimal structuring of business presence as well as commercial transactions involving international and domestic clients in Ukraine. Denis is a member of the International Bar Association (IBA), the Kyiv City Bar (admitted since 2003) and the Ukrainian Bar Association (UBA). Denis has been repeatedly recommended by reputable international and local legal rankings such as Best Lawyers, Chambers Europe, Chambers Global, Legal 500, IFLR 1000, Who’s Who Legal, and in the 100 Best Lawyers in Ukraine (Clients Choice) by Legal Gazette (Ukraine).